As a professional journalist, Lucinda Franks has been trained to uncover even the most closely-held information. That skill has served her well over the years, particularly in the 1970s, when she won a Pulitzer Prize for a newspaper series that examined the Weathermen and the life of Diana Oughton, a young, middle-class revolutionary who died in a Greenwich Village townhouse while constructing a bomb. Franks later went on to marry another crack investigator, Robert Morgenthau, New York’s longtime District Attorney. Though Morgenthau was thirty years Franks’ senior, the union created one of New York’s most glamorous power couples. Franks showcases her reporting skills in her new memoir, My Father’s Secret War, a sort of military mystery set against the backdrop of a family fractured by alcohol, infidelity, and emotional dysfunction.Franks’ search for the truth behind her father’s military record in World War II forms the heart of the book and her discoveries lead to the pair’s eventual reconciliation. As the book commences, Thomas Franks is on the verge of being evicted from his Massachusetts apartment. His daughter is all too familiar with this state of affairs, and his troubles reinforce her desire to escape his emotional clutches. While she was once close to her father, she now is filled with bitterness at how he treated their family. Franks reluctantly travels from New York to Boston to put her father’s affairs in order. She is shocked by what she finds – an apartment crammed so full of old newspapers and magazine that visitors can only navigate through a narrow aisles, boxes of opened cereal crawling with weevils, and old Styrofoam take-out cartons piled high in the kitchen. Franks suppresses her revulsion and makes weekly pilgrimages to sort through her father’s stuff. One day, as she is emptying old boxes, she stumbles upon a Nazi hat and a German Iron Cross. What is her father doing with Nazi war memorabilia? Franks knew he served in World War II, but he was always vague about his actual duties. Was it possible that he was a Nazi spy? The thought crosses Franks’ mind and for a few tantalizing pages the reader thinks this will be a book about betrayal, deceit, and a lifetime of illusion. But it soon becomes clear that Thomas Franks fought on the side of Allies. What he did remains the mystery that Franks unravels in the book. Children often spin fantasies about their parents’ lives before they were born. And as they grow up, they often define themselves in opposition to their parents, becoming what their parents are not. Franks spent much of her adulthood pushing away from her father, but she stops opposing him when she discovers his war memorabilia. Instead, she becomes intensely curious about what he did in the war and whether or not his experiences led to the fractured family she mourns for. It’s like she takes a shift, from child to reporter, and the different vantage point lets her see her father in an entirely new way. But Thomas Franks is a reluctant interview. While he will acknowledge he was one of the first Americans to go through the Ohrdruf death camp in April of 1945, he won’t reveal precisely why he was sent there, except to say he was ordered never to reveal any information for the rest of his life. Franks becomes convinced her father was a spy, and becomes determined to get him to admit it. Much of the book describes Franks’ efforts to extract information from her father. She pushes him with question after question, eliciting tiny bits of information with each conversation. Unfortunately much of the dialogue feels false and stilted. Conversations like this run throughout the memoir, interrupting its flow. Besides lacking spark, it’s difficult to believe Franks remembers the actual conversations she and her father had years ago. Franks tries other ways to bring her story to life, but unfortunately she doesn’t have the most compelling material to work with since the heart of her search was a series of question and answer sessions. Franks describes traveling back and forth between New York and Boston or taking her father to her apple farm in upstate New York or beach house on the Martha’s Vineyard. She describes searching through the many boxes that fill the rooms of her father’s apartment or hunting down his old mistress to ask her for clues to her father. She spends days consulting with military experts and leafing though documents in the National Archives in Washington D.C. These scenes are not particularly exciting. That doesn’t mean Franks’ isn’t a good writer. Ironically, the most vivid part of the book has nothing to do with Franks’ father. It concerns her son Josh, who ruptures his spleen while bodysurfing in Martha’s Vineyard. Franks creates a lot of tension describing how she rushes Josh to the hospital, only to be reassured by the EMTS and nurses that he just has a few broken ribs. Franks senses that something more serious has happened, and the reader is gripped to see how Franks forces the hospital staff to examine her son more closely. “Don’t leave me,” he rasps. I can barely hear him. Tell me that scene doesn’t get the reader’s heart racing. Franks is less effective at creating an emotional arc for the rest of the book. She describes an unhappy childhood where her parents were estranged and she and her sister fought frequently. Franks wants the reader to rejoice when she finds happiness with Morgenthau and her children and for her professional triumphs. But somehow it just doesn’t seem all that important. The strength of the book lies in Franks’ reporting skills as she uncovers previously-secret Allied spy missions. By hammering away at her father, questioning him in different ways over a number of years, Franks discovers he was part of a secret spy squad known as the Argus, named after an all-seeing mythical creature with more than one hundred eyes. There were twenty small Argus groups attached to the Division of Naval Ordnance and they were nimble and highly effective units that would land on just-captured islands in the South Pacific and set up mobile radar stations to help identify incoming enemy planes or ships. The history of the founding of the Office of Special Services, or OSS, which eventually became the CIA, is well-documented. Franks uses her reporting skill to show that the Americans were operating numerous spy operations, some that didn’t even know about one another. 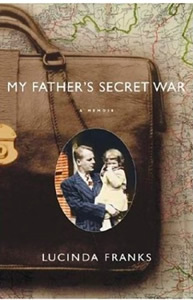 For military history buffs and those who have a particular fascination with World War II or creation of the American spy apparatus, My Father’s Secret War will be a worthwhile read.